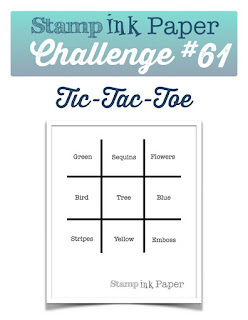 Tina's Crop Shop: SIP Challenge #61 Tic-Tac-Toe from Lisa! Hello and Happy Tuesday! Are you ready for another SIP Challenge? This week we have another fun Tic-Tac-Toe from Lisa! I went straight across the middle with Bird, Tree, and Blue. Here's my card.. I have to tell you that I absolutely Love this sentiment from Unity Stamp Company but it is so large, it can be a bit tricky to use. 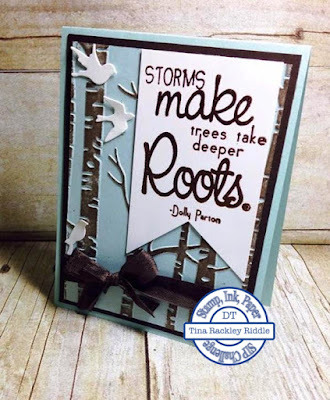 I had to get the elements in so for my tree with this sentiment I decided to use this awesome Stampin' Up! Woodland Embossing Folder. I brayered soft suede ink over the embossed 3 3/4" x 5" Soft Sky Layer. Now I have another confession.. and I'm pretty sure if you take a good look at this card, it is no secret... I am not good at brayering on embossed images. There.. I've said it! I have one of the old type brayer and I really believe that the new Stampin' Up! Sponge Brayers would probably be much easier to do this technique. I'm going to order some on my next order so stay tuned.. I'll let you know! I heat embossed my sentiment in the new Copper Embossing Powder onto Whisper White and then used Banner Framelit Dies to cut it out. The birds are Little Bird Dies from Gina Marie and were adhered with glue dots. I layered my card front on a 4" x 5 1/4" piece of Early Espresso Cardstock and then layered that on an 11" x 4 1/4" cardbase that was scored at 5 1/2". For some reason I've been loving top folding cards lately! Thanks so much for stopping by! Below are links to all of the products! Unity Stamp Co. "Storms Make Deeper Roots"
Gina Marie "Little Bird Dies"